Looking for the best analytics solution for your WordPress website? Want to know if there are alternative solutions to Google Analytics? To run a successful online business website, you need an analytics solution that helps you gather website data and provide actionable insights. This helps you eliminate the guess work and start making data-driven decisions to grow your business. You may already know that Google Analytics is the most popular website tracking solution out there, but there are a lot of other products that take a different approach to website tracking. In this article, we’ll compare some of the best analytics solutions for your WordPress website. With over 1 million active installs, MonsterInsights is the best Google Analytics plugin for WordPress. MonsterInsights makes it super easy to connect your website to Google Analytics and offer comprehensive tracking features. Even though Google Analytics is built for tracking almost every user interaction on your website, like form submissions, ecommerce transactions, file downloads, etc., the default Analytics setup doesn’t allow you to make use of the full potential of Analytics tracking. For example, if you want to track an onsite event, like form submissions tracking, you’ll either have to add the custom event tracking code into your website or set up Google Analytics goal for every form. This can be tedious and time consuming especially if you’re not a developer or an Analytics expert. With MonsterInsights, you can enable different tracking features in just a few clicks without having to touch a single line of code. At a glance, you can review your site’s performance right within your WordPress dashboard without logging into your Analytics profile. A lite version of the plugin is available to download for free from the official WordPress plugins repository. The pricing starts at $39 for a single site license. Get started with MonsterInsights today. Want to start with the free version instead? Try the MonsterInsights Lite. Heap allows you to track every event on your website or mobile app automatically. For example, on the web, Heap tracks click, form submission and more without any work on your part. On mobile, Heap tracks every touch, swipe, tap and any other gesture event without any configuration. The main difference between Heap and Google Analytics is that Heap is focused on automatic events tracking whereas Google Analytics can only track pageviews automatically. Heap also makes individual user tracking easy, even if it’s across separate devices and cookies. With Heap’s Event Visualizer, you can easily set up conversion funnels or do segmentation analysis in a few seconds without knowing any code. If you want to track your website or iOS app that requires conversion funnels or segmentation analysis, Heap will make your job quick and easy. The free version of Heap allows you to track only 5000 sessions per month. The full version is available for companies with custom pricing. Get started with Heap today. Jetpack’s WordPress.com Stats is a free plugin that gives you quick stats about your website traffic at a glance within your WordPress dashboard. It isn’t anywhere near as comprehensive as Google Analytics, but it gives you a basic overview of your traffic numbers on your WordPress dashboard. WordPress.com Stats comes bundled with the Jetpack plugin as a module. To be able to track your traffic with Jetpack Stats, you’ll have to install Jetpack, activate the Stats module and connect your website to WordPress.com. It might not be the right solution if you’re not already using any other Jetpack functionalities on your site. Get started with Jetpack’s WordPress.com Stats today. 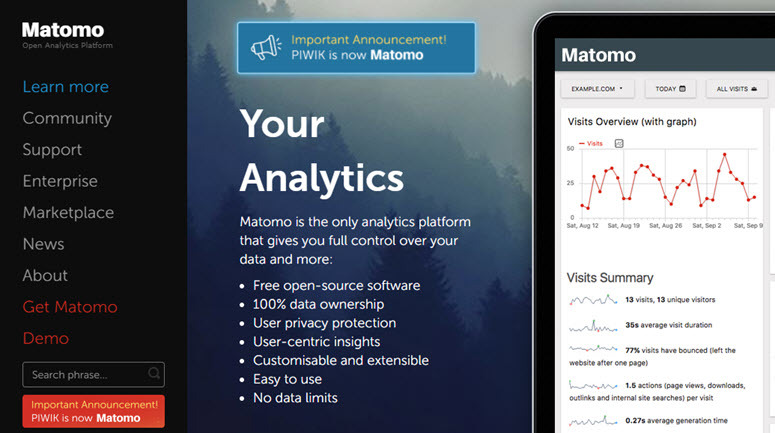 Matomo, previously known as Piwik is a leading open source analytics software that lets you track user interaction on your website with ease. It comes with all the set of features you can think of including, events, goals, ecommerce, logged in users, heatmaps, a/b testing and a lot more. Just like WordPress, Matomo comes with both self-hosted and cloud-hosted versions. With self-hosted Matomo, you can track user interactions on your site by installing it on your server. If you need hassle free website tracking, then you might want to use cloud-hosted Matomo, so you can skip the technical step and enable website tracking quickly. The self-hosted Matomo is free of cost. The pricing for cloud-hosted Matomo is based on pageviews tracked across your websites and mobile apps. For the cloud-hosted version, the pricing starts at $7.5 per month for 5 websites up to 50,000 pageviews. Get started with Matomo today. Parse.ly is an analytics platform with easy to use interface that gives you clear audience insights. Parse.ly is helpful for both beginner and advanced users alike. Parse.ly offers 3 products: content dashboard, API, and data pipeline which can be purchased individually or as a bundle. With its easy to use content dashboard, Parse.ly gives you a clear picture of your website visitors in real time. You can easily explore historical trends and take data-driven decisions to boost your revenue. With its content powered APIs, you can create great user experiences based on your audience analytics. Using their powerful recommendation engine, you can double your pageviews and increase time spent on site. Their data pipeline lets you unlock 100% of your data in an easy-to-query and transport data format. They offer custom quote for their products based on your website’s needs. Get started with Parse.ly today. Mixpanel tells you how users engage with your products, whether it is your website or mobile apps. It tells you who your users are and measures the actions people take on your product and help you take data-driven decisions quickly and easily. Mixpanel allows 2 types of pricing plans—engagement and people plans. You can choose any of them that work to fit you as you grow. With people plan, you can collect data of 1000 user profiles at most for free. With engagement plan, you can collect up to 20 million data points per month. The downside of MixPanel is that it’s not as easy to setup when compared to MonsterInsights or Jetpack Stats. Get started with Mixpanel today. Adobe Analytics is an advanced analytics tool for enterprise level websites by Adobe Systems. It lets you understand your customers and how they interact with your brand through visualizations, cross-channel marketing capabilities, and advanced analytics. It also lets you determine your most valuable customer segments and empower you to better serve your customers through customer intelligence. Moreover, it enables you to measure user interaction on your mobile apps to deliver better digital experiences across devices. Get started with Adobe Analytics today. Which is the Best Analytics Solution for WordPress? The answer to which is the best analytics solution for WordPress really depends on your needs. When it comes to website tracking, every solution takes a different approach. Before you dive into choosing a product, it’s worth taking a moment to understand which analytics solution is the right fit for your needs. For most websites, Google Analytics combined with MonsterInsights is the perfect solution because it offers event tracking, eCommerce tracking, affiliate link tracking, form tracking, and more. Compared to any other analytics plugins including WordPress.com Stats, MonsterInsights stays ahead of the curve in all aspects. It’s far more comprehensive and gives you beautiful reports within your WordPress dashboard, so you can get important stats at a glance that matter the most for your website. Get important analytics stats in your WordPress dashboard. Unveil more possibilities of Google Analytics, like eCommerce tracking without the complex setup. Unlock advanced user tracking but are under a limited budget. On the flip side, if you want an analytics solution that enables you to track onsite events for your website and mobile apps automatically without any third-party plugins, Heap might be the right solution for you. We hope this article helped you find the best Analytics solution for your needs. If you enjoyed this article, you might also want to read How to Protect Your Mac from Malware.